Whether moving to a new community or across the country, relocating comes with its challenges. Many of the hurdles of moving are obvious, and therefore easy to prepare for – like mapping out your new work commute. But for every obvious adjustment you make, there are countless others that are far more subtle, like discovering the best places to entertain each member of your family. Dubbed Sherwood Park’s “entertainment destination,” Festival Place provides a stage to enjoy both amateur and professional artists. From local high school drama productions to international musical performances, Festival Place offers Sherwood Park newcomers the perfect venue to immerse themselves in the art scene. Sherwood Park has not one, but three vibrant Farmer’s Markets – with each dishing out a variety of fresh produce, delicious baking, and quality wares from local artisans. So whether stocking up on the week’s groceries or simply meandering the stalls, visitors will enjoy meeting the friendly locals and producers. Fitted with a wave/activity pool, lane swimming, an indoor track, massive fitness centre, child minding services, a youth lounge, ice rinks/skating centre, soccer pitches, an indoor playground, AND a skate park (phew! ), Millennium Placeprovides Sherwood Park residents with seemingly endless opportunities for people of all ages and interests to be active. 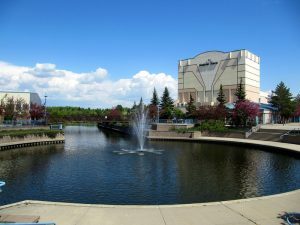 Developed just over two years ago, the Broadmoor Lake Park area is THE place to be in Sherwood Park’s warmer months. Designed for toddlers and teens alike, this playground/spray park combo features it all! From the all-ages spray zone (equipped with a Viking ship, mini river, and fountains) to the sprawling play structures (with lighthouse climbing rocks, a pirate ship, and a soaring rope tower), this park is a blast! If you have any questions about Sherwood Park’s amenities and attractions, reach out to our team today. We are proud to call this place home, and would love to share the insight we’ve gained from living and raising our families in this fantastic community!